The PepsiCo Foundation contributed $50,000 to the National Association of Hispanic Journalists (NAHJ) for scholarships and internships to deserving students interested in pursuing careers in journalism and social media. 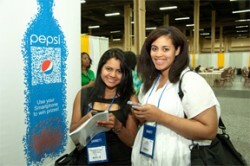 Tim Russell, Public Relations Director at PepsiCo, announced the donation during the NAHJ Hall of Fame Gala at the UNITY’12 convention, the largest gathering of minority journalists in the nation, held from August 1-4 in Las Vegas. This donation is part of La Promesa de PepsiCo, PepsiCo’s Hispanic initiative focused on Latino empowerment and the issues that matter most to Hispanics including Latino education, employment opportunities, promoting active lifestyles, and investing in science to develop healthier products.